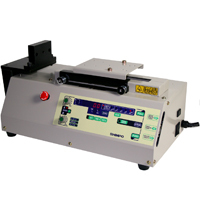 Shimpo’s advanced motorized test stands allow the user to obtain the most accurate, repeatable results available in the market today. Their all steel construction makes them remarkably rugged, while programming and cycling capabilities enable them to be highly intelligent. All stands have the ability to interface with our top quality force gauges, providing complete force measurement systems for the most precise testing applications. Because speed, distance, and time are controlled by the user in either a vertical or horizontal model, our motorized stands can be configured for any application. One year warranty.